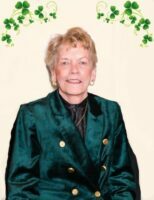 Visitation for Lorian L. McGinty, 77, of Long Grove, will be from 3:00 PM until 9:00 PM on Friday, March 29, 2019 at the Ahlgrim Family Funeral Home, 415 S. Buesching Road, Lake Zurich. Prayers will be said, 10:30 AM on Saturday, March 30, 2019, also at the funeral home, proceeding to St. Francis de Sales Church, 33 S. Buesching Road for the Funeral Mass at 11:00 AM. An Interment will follow at St. Michael the Archangel Cemetery, Palatine. Lorian was born on July 22, 1941 to Edward and Margaret Connell. She passed away at home on Saturday, March 23, 2019 with her family by her side. Lorian grew up in Chicago; in 1961, she married Charles P. McGinty. They moved to Long Grove in 1971 where they raised their family while Charles owned and operated McGinty Bros, Inc. Lorian was a long time member of St. Francis de Sales Catholic Church where she proudly started the Girls Basketball Program and coached for many years. Lorian was the beloved wife of the late Charles P. McGinty for 49 years. She is survived by her children, Charles Jr., Mike (Christine), Tim (Mary) and Brian (Beth); grandchildren, Meghan, Kristin (Jack), Molly, Katie (Kevin), Madison, T.J., Callahan, Jake, Marisa, and Karrick; great-granddaughter, Olivia; and her siblings, Patrick (Terri) Connell, Tom (Mary) Connell, Ed (the late Bonita) Connell, Marge (the late Dennis) Polowy, Kate (Larry) Budnick, Colleen (the late Joe) Arns, and Kelly (John) Dall. In lieu of flowers, donations would be appreciated to the St. Francis Girls Basketball Program.